"My Dear Sir, - I have just heard in this distant place, where I am staying for a little while, seeking rest and change after my recent bereavement, of the very severe and uncalled for enforcement of discipline by your commander, and desire to express my deep sympathy with you under it, and to urge you to look up to the Great Commander, the Lord Jesus Christ, in the interests of whose cause and kingdom I believe you to have laboured since your coming to Hanley, and He will cheer you and comfort you, because He knows the spring from which all our actions flow. I should be glad if something could be done to retain your services in Hanley, where evidently the Lord hath blessed you. Were I at home, I could talk with you on the matter. Suffer me to commend you to God and the Word of His grace. For about ten days I remained in Hanley holding meetings in the neighbouring towns arranged by the Testimonial Committee, in whose hands I was. From every one of these meetings I was carried home shoulder-high and accompanied by a brass band, a distance of from one-and-a-half to two miles. There was no escaping from these demonstrations. The people were simply irresistible. If I took a cab they pulled me out of it. I was riding on the crest of the wave. But I felt that this excitement could not keep on long, that it must soon spend itself. Accordingly, I went to Cambridge for a week in order to secure quiet, to realise myself, and to think calmly and prayerfully over the situation. I was made to promise that when I came back I would hold meetings on the Sundays, wherever the Committee decided upon. In my absence at Cambridge the Imperial Circus, a building capable of seating over four thousand people, was secured for next Sunday's meetings. It had been built at a cost of £14,000, but the Circus Company had failed, and the structure, which stood on three thousand square yards of land, was in the hands of the National Provincial Bank. When I returned for a Sunday's services the congregations were overwhelming. At these meetings the Committee made a strong appeal to me to remain in Hanley for the sake of the work, of the hundreds of people who had been rescued from sin and misery, and of the hundreds more who were ready to listen to me. Mr. William Brown, a miners' agent, very well known in the district, made a speech in which he asked my sister and myself, "for the sake of the suffering poor and the cause of Christ," to reconsider our determination to labour as general evangelists and to confine ourselves to the Potteries and the neighbouring towns. The Committee disclaimed any intention of acting in opposition to the work of the Salvation Army. I told the people that since General Booth had dismissed me from the Army I had received letters every morning inviting me to conduct special missions in different parts of the country. I said to the vast congregation that I must have time to consider my decision, and intimated that we intended leaving Hanley again at once for a week to recruit our health. There were at least twelve thousand people in these three Sunday meetings. I felt that I must really get away from these crowds and the excitement. In my absence my friends and sympathisers were busy. The Rev. M. Baxter, editor of the Christian Herald, and the promoter of "The Gospel Army" movement, took a leading part, along with the local men, in the deliberations. At first there were some doubts about taking the Imperial Circus, but Mr. Baxter stated that if the Committee did not see their way to do this, he would himself hire the building for religious services. Accordingly the circus was secured by the Committee for three months. It was arranged that two ladies, connected with the Gospel Army movement, should conduct the services until I could make my own arrangements. Alderman W. Boulton, Mayor of Burslem, a Wesleyan Methodist, was elected president of the Committee; the Rev. T. Dc Vine, Vicar of Northwood, and Councillor Nichols, Wesleyan Methodist, vice-presidents; Mr. R. Finch, a Wesleyan local preacher and former treasurer of the Salvation Army local corps, was elected treasurer; Mr. James Bebbington, corresponding secretary; and Mr. Hodgson, financial secretary. The other members of the Committee included Mr. Tyrrell, a churchwarden, Mr. W. T. Harrison, a Congregationalist; and Mr. Bowden, a New Connection Methodist, and this year (1901) Mayor of Burslem. It was altogether a very strong and representative Committee, and remains so to this day. My Committee, you will see, was thoroughly representative of the Free Churches, of the townspeople, including business men and the hundreds of working people who had been converted during our stay in the town. Besides, many joined us out of mere love of fair play and sympathy with those whom they thought to have been uncharitably dealt with. I had promised to stay a month, but the month grew into four years in all. The fact is, that when the month was up the world had become so important and so large, that I felt it would have been sinful to leave it just then. Under the control of my strong Committee, it went on with an ever-increasing volume and force. They paid me £300 a year for my services. The building for nearly two years was crowded every night and at the three services on Sunday. We had the largest congregation outside London. The result of these labours is to be found in many homes. In hundreds of Churches and Sunday-schools to-day all over the land and in other lands are found officers, teachers, superintendents, class leaders, local preachers and Christian workers who were converted under my preaching, while many others who were at that time turned unto God have passed in triumphant deaths to their reward. Our mission was an inspiration to the Churches. It will be remembered that when I first started my open-air work at Hanley, the people threw pennies to us, thinking that we were labourers out of work. But very soon I beheld the leaders of the Free Churches, their ministers even, engaged in open-air work. And even the Incumbent of St. John's, with his white surplice and his surpliced choir, began to conduct open-air services in the Market Place, marching through the streets, after the service was over, to the old church, singing "Onward, Christian soldiers." I regard the action of the Vicar in some ways as the greatest compliment that was ever paid to me in Hanley. It was our custom to meet at 5.30 on Sunday night for a prayer meeting, preceding the large public meeting at 6.30. The place of gathering was a large side room, which had been used by the circus people as a dressing-room, and was situated over the stables. Late in October, 1882, three hundred of us were in this room, singing praises to God and asking for His blessing on the coming service. While we were singing a hymn the floor opened in the centre and dropped us all down into the stables, a distance of ten or eleven feet. Seventy-five persons were injured; arms and legs were broken, a few skulls were fractured, and there were bruises galore. But not a life was lost. The people, gathering in the large hall, heard the crash and were terrified, but there was no panic. Some of the stewards were on the spot, giving all the help they could. Doctors were sent for, and the injured were taken home in cabs. As soon as I could extricate myself from the falling debris, it occurred to me that the people in the great building would be in fear as to my safety. I rushed to the platform, explained in a few simple words what had taken place, told the people that all possible help and attendance was being rendered to the injured, and begged them to keep calm and cool. And then I retired to pass a few minutes of acute agony. I was urged to give up the service that night, for though my body bore no bruises, my nerves had sustained a severe shock. However, I insisted on taking my place. But our troubles were not yet over. When I reached the platform I quietly asked the caretaker to turn on the lights full, and he, poor fellow, in his nervousness and excitement, turned them out. Immediately there was a scene of confusion and fear. Mr. Brown, the miners' agent before mentioned, saved the situation by his presence of mind. He at once began to sing "Jesus, Lover of my soul," and sang it with great effect, for he was a very good singer. The people presently joined in the hymn, and very soon all were calm. In the meantime the lights had been put full on and the service swung on its way. I preached as well as I could, but at the close of the service - so much had the nervous shock weakened me - I had to be carried home. Months passed away before I really quite recovered. I went on with my work, but not without fear and trembling. Even now, occasionally, when I am face to face with a great crowd, something of the feeling of that night comes back to me. None of these things - not even my dismissal from the Salvation Army - at all hindered our work of saving and redeeming men. The revival swept on like a mighty river, carrying everything before it. Strangers to the town seldom went away without paying a visit to the mission and witnessing for themselves the work that we were doing. And so, when I visit towns to-day, people frequently say to me, "Oh, Mr. Smith, I heard you at Hanley in the old days." In March, 1883, my friends in Hull invited my sister and myself to conduct a fortnight's mission in their town. I had many spiritual children in Hull, and I was naturally eager to see them. My Hanley Committee granted me leave of absence. We were welcomed at Hull Station by from 10,000 to 20,000 people. A carriage, with a pair of grey horses, was waiting for us to convey us to our hosts. But the people unyoked the horses and dragged us in the carriage all over the city. The meetings were held in Hengler's Circus, a building with accommodation for over 4,000 people. This was all too small for the crowds that gathered every night. When the fortnight came to an end the Committee who had arranged the mission determined that the work should not cease, and resolved to establish a local mission of their own. It was settled there and then that my sister and Mr. Evens, to whom she was shortly to be married, should take charge of the Hull Mission, and that they and I should change places pretty frequently for a week or a fortnight. Mr. Evens, who was by trade a joiner, had been a captain in the Salvation Army, and, I may say here, has for the last eight or nine years been engaged along with his wife in the Liverpool Wesleyan Mission. For nearly two years our arrangements for the Hull Mission continued and worked well. At the end of that period Mr. Evens took up the work of a general evangelist, and Rev. G. Campbell Morgan, who has since acquired a world-wide reputation, succeeded him. It was thus I first met Mr. Morgan, and from the beginning I formed the highest opinion of him. My expectations of his usefulness and eminence have been fully realised, but not more fully than I anticipated. After eighteen months' good service at Hull he settled at Stone; thence he was transferred to Rugeley; thence to Birmingham; thence to London. The rest is known to all the world. In the summer of the same year I had my first experience of foreign travel. I went on a trip to Sweden, as the guest of Dr. and Mrs. Kessen and of the late Mrs. Poulton. They were members of the Hull Mission Committee. I had some delightful experiences during this pleasant holiday. My first Sunday morning in Sweden was spent at Stockholm. I went to the meeting of the Salvation Army. The captain was a Dane, who had been trained at the Army Home in London. I had not been five minutes in the building, where some 500 people were gathered, before they found me out, and asked me to sing. I gave them "Oh, touch the hem of His garment." The captain told the people the number of the hymn in the Swedish Army Hymn Book, and while I sang in English they took up the chorus in their own tongue. There were tears in the eyes of many strong men as the sweet hymn found its way to their hearts. I sang again in the evening meeting. At both services I spoke a few words, which were translated to the listeners. One day I went to the King's palace and saw the splendid furniture and the beautiful rooms. As we stood in the corridor the King himself passed down and graciously nodded to us. On another occasion we went to see the King reviewing his troops. Amidst all the military show one little incident touched me most. A little sweep came running past the spot where the King was on his horse. His face was black, and his feet were bare, but as he passed the monarch of Sweden he raised his dirty hand and saluted his Sovereign. The King smiled upon the little fellow and returned the salute. Immediately afterwards a dashing officer came galloping up on a fine horse. His uniform shone like gold and his sword rattled as he careered bravely along. He also saluted his King. The King saluted back with all the dignity of a Sovereign, but I thought I missed the kindly gleam of the eye with which he had greeted the waving of the little sweep's dirty hand, and I said to myself: "This King loves the little sweep as much as the fine officer. And I love him for it." The work in Hanley went on without any abatement of interest, attendance, or result. Having to face the same huge congregation so constantly, I began to feel acutely the need of wider reading. I had read very little outside my Bible until I left the Army. My time had been fully occupied in teaching myself to read and write and in preparing my addresses. Remaining at the longest only six or seven months in each place, my need of more extensive knowledge had not been brought straight home to me. But now my stay in Hanley was extending into years, and I must have something fresh to offer my congregation every time I met it. And so I set myself to study. My first reading outside my Bible consisted of Matthew Henry's Commentaries, the lives of some early Methodists, the Rev. Charles Finney's "Lectures on Revivals," "Sermons to Professing Christians," and "The Way of Salvation," and the books of Dr. Parker, Dr. McLaren, Robertson of Brighton, something of Spurgeon and of John Wesley. At this time too I began to taste the writings of Scott, Dickens, Thackeray, Tennyson, Whittier, Byron, Longfellow, George Eliot, and just a very little of Carlyle and Ruskin. I read for two things - ideas, and a better grip of the English language. As I toiled through these pages - for my reading was still toiling - I lived in a new world. What an ignorant child I felt myself to be! I felt confident, too, that some day the people would find out how little I knew and get tired of coming to hear me. But they were kind and patient and put up with my many blunders and limitations, for they loved me and they knew I loved them. I was to multitudes of them a spiritual father, and even to some of them a grandfather. Whenever I was announced to preach the people came and God gave the blessing. This was my comfort and encouragement. Without these supports I should have utterly failed. My soul was possessed of a deep thirst for knowledge, and I greedily drank in my fill during the few hours I could find for reading. For I had nine public services a week, each preceded by an open-air meeting, and I had much visiting to do. Consequently the time for reading even with a view to my work, was short. When I look back upon those days I humbly and gratefully marvel at the great use God was able to make of me, with all my manifold imperfections. This hard grind in Hanley, and the constant preaching to congregations mainly composed of the same people, was an invaluable schooling for me. I was getting ready for the wide-world field of evangelistic work, not knowing, of course, that this was before me. As Moses was forty years in the desert of Midian, being trained for the work of leading forth the children of Israel, so was I, a poor gipsy boy, moulded and disciplined in Hanley during this time for my life's work in the Churches of England, Australia, and America. A few words about our Church polity - if I may use this impressive phrase - in Hanley, may fittingly come in here. When I began my work in the town the Army had not enlisted more than twenty soldiers. Before my term as an Army officer came to an abrupt end we had raised the number to between 500 and 600. Our services in the Imperial Circus had not continued long before we had enrolled over 1,000 members, all converted under my ministry. We had never any celebrations of Communion in the circus, but at regular intervals we repaired in a large procession to one of the Non Conformist Churches, and there took Communion. I should say that not a few persons who were brought to God in the Imperial Circus left us immediately after this great event in their lives, and joined themselves to the Churches with which they had been formerly, in some more or less loose way, associated. Saving that there was no dispensation of the Holy Communion (except during the later part of my stay), we were in all respects a regularly organised congregation; with Sunday-schools, classes, and the usual societies. I say this in order that no one may regard the Hanley work simply as a prolonged mission, although it is true that all my services were evangelical and most of them evangelistic. I was in the "regular ministry" during these years at Hanley, if ever a man was. In my congregation were seven or eight members of the Town Council. The Mayor, the magistrates and all the members of the municipality were in sympathy with us and would do anything for us. The mission was a great fact in the life of the town, a force that had to be reckoned with. I do not think I exaggerate when I say that my congregation held in the hollow of their hands the fate of any candidate for municipal office. I had a devoted, enthusiastic, and hard-working band of helpers, who relieved me of the great multitude of lesser duties which a Church has to perform, and left me free for my platform work. My people were very liberal. We had a collection at each service. The British working man is not at all afraid of the collection-plate. Several times, in moments of absent-mindedness, tension or excitement, I have forgotten to announce the collection, but I was promptly reminded of my negligence from many quarters of the building. "The collection has not been made, sir!" was the cry of many voices. I had taught the people that giving was as Scriptural as praying or hymn-singing, and that the collection was part of the worship. In October, 1885, the autumnal sessions of the Congregational Union of England and Wales were held in Hanley. The Free Church ministers of the town prepared an address of welcome, and arranged that a deputation of their number should address the Union. I had seen most of these ministers come into the town and had seen their predecessors depart. Although I represented by far the largest congregation in Hanley, a congregation that would have made more than half a dozen of most Free Church congregations in the town, I was not invited to join the deputation. When the secretary of my Church inquired the reason why, he was answered, "Oh, he's not an ordained minister." That was to them reason enough for passing me over. I was hurt, but I said nothing. "Brethren, I did feel hurt that you did not invite me to accompany you on this occasion. I know I have not been ordained, but I am your brother. I have not had the hand of priest or bishop or archbishop laid upon my head, but I have had the hands of your Lord placed upon me, and I have received His commission to preach the everlasting Gospel. If you have been to the Cross, I am your brother. If you won't recognise me, I will make you know I belong to you. I am one of your relations." The delegates applauded loudly while I said these words, and I continued: "You see what you have done. If you brethren had invited me to come with you I should have quietly appeared like one of yourselves, but since you ignored me, you have made me the hero of the day." The Christian World published an interesting article of some length on this incident, from which I may be permitted, without offensive egotism, to extract a few sentences: "Few incidents outside the serious proceedings of the Congregational Union meetings at Hanley excited deeper interest than the appearance on the platform of Gipsy Smith. Till Dr. Hannay announced him, but few, it maybe presumed, had ever heard of him. When the young man rose, presenting a dark but not swarthy countenance, there was nothing, save a flash of fire in his black eyes as he gazed round upon the assembly, that would have indicated that he came of a gipsy tribe, or that he was anything different from an ordinary youth of the middle class. He certainly had never stood up in such an assembly before. His manly tone, his handsome presence, his eloquence, and his earnestness procured him a flattering reception from the assembly." The working people's meeting in connection with the sessions of the Union was held on the Thursday night in the Imperial Circus, and in this gathering I sang a solo. "There can be little doubt," says the writer I am quoting, "that if he did nothing else the multitudes would crowd to hear him. Accompanied by a small harmonium, he poured forth, with great taste and skilful management of voice, which was subdued by the deepest emotion, the most exquisite strains of sacred song. The burden of it was an exhortation to pray, praise, watch, and work, the motive to which was urged in the refrain that followed each verse, 'Eternity is drawing nigh.' So far as we had the opportunity of judging, the young gipsy's speech is as correct as his singing. We saw nothing coarse in the young man's manners, and heard nothing vulgar in his speech. "He is doing more good than any other man in Hanley," said an enthusiastic Methodist couple with whom we fell in - of course, they meant as an evangelist among the masses. All the ministers we met with who had come into personal contact with him were as astonished at the amount of culture he displayed as at the simplicity and force of his address. The many ministers and other men of intelligence who during last week were brought into personal contact with Gipsy Smith would one and all express for him the heartiest good-will, coupled with the sincerest hope that the grace given to him will be to him as a guard against fostering any feeling in his heart opposed to humility, and to the manifestation of any spirit such as the enemy loves to foster, that thereby he may mar a good work." And now invitations to evangelistic work began to pour in upon me, mostly from Congregational ministers. These invitations I at first uniformly declined, but I was prevailed upon to go to London in December for a mission at St. James' Bible Christian Church, Forest Hill, of which the pastor was the Rev. Dr. Keen. I remember this mission very vividly, for it marked the beginning of a new era in my life. It opened my eyes to my true gifts and capacities, and showed me clearly that I was called to the work of a general evangelist, the work in which for sixteen years I have been engaged and in which I fully expect I shall continue to the end. Dr. Keen wrote an account of the mission for the Bible Christian Magazine, under the title, "A Tidal-wave of Salvation at Forest Hill." On the first Sunday evening the building was packed, more persons being present than when Charles H. Spurgeon preached at the opening of it. On the second Sunday evening scores of persons were outside the church doors three-quarters of an hour before the service was announced to begin. When I appeared in the pulpit every inch of standing ground in the church was occupied - vestries, pulpit stairs, chancel, lobby, and aisles. Hundreds of persons had to be turned away. Dr. Keen concluded his account with these words: "There has been no noise, confusion, or undue excitement throughout, but deep feeling, searching power, and gracious influence. The whole neighbourhood has been stirred. 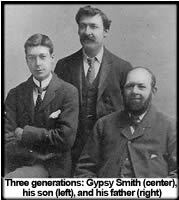 Gipsy Smith is remarkable for simplicity of speech, pathetic and persuasive pleading, and great wisdom and tact in dealing with souls. His readings of the Word, with occasional comments, are a prominent feature in his services, and done with ease and effect. In his addresses he is dramatic and pungent, while the solos he sings are striking sermons in choicest melody. He is a gipsy, pure and simple, but God has wonderfully gifted him with the noblest elements of an evangelist, and made him eminently mighty in the art of soul-winning." The mission made a deep impression upon my own soul. I perceived clearly that my voice and words were for the multitude, that I had their ear, and that they listened to me gladly. I now took occasional missions, and wherever I was announced to preach the people flocked to hear me, I had great joy in preaching to the multitudes and some little power in dealing with them. The people were calling me, the Churches were calling me, and above all God was calling me to this new field of work, in which, indeed, the harvest was plenteous and the labourers were few. Every day brought me more and more invitations to conduct missions, and the conviction that here was my life work took such a hold upon me that I could not get away from it. After much prayer and many struggles I resigned my position at the Imperial Circus, Hanley. My people felt the blow very acutely, so did my many friends in the town, and so did I. But, as I was still to have my home in Hanley and give all my spare time to the mission, the wrench was not as severe as it might have been. I cannot conclude this chapter on the dear old Hanley days without the deepest emotions of love and gratitude to my troops of kind friends in that town and without expressing my thanks to Almighty God for His tender guidance of me in those times of stress, difficulty, and crisis. Never was more love bestowed upon mortal man than was showered on me by my friends in Hanley, and never have I worked among a people whom I loved more deeply and more devotedly. They were very good to me, and I did my best for them. No one knows as I know in my heart of hearts how poor the best was, but God was pleased to make it His own and to bring forth much fruit out of it to His praise and glory. Hanley and my Hanley friends have a pecuIiarly tender place in my heart. The very mention of the name makes my spirit rejoice with great joy in God my Saviour, who filleth the hungry with good things, while the rich - those who are conscious of gifts and graces and powers above the common - may be sent empty away. Only the resurrection morn shall reveal the great things that God wrought in that town by the hand of that unworthy servant of His who pens these poor, faltering lines of praise and love.